I still consider myself an absolute beginner at this, but I’ve realised that even an absolute beginner can quite easily make a quality beverage, and learn something about what beer actually is at the same time. I wondered, then, if my self-proclaimed beginner status could make it easier to encourage other people to try brewing for themselves. Last weekend I attempted to pass on my inexpert knowledge to my friend Heidi, who displayed an interest when she heard that I was homebrewing. Having recently enjoyed some of Plevna‘s Smörre Rye IPA, she wanted to try making something similar. Challenge 1: find/concoct a recipe for a Smörre clone. This tested sekä my knowledge of brewing että my knowledge of the Finnish language, as I checked local homebrew forums for inspiration. Friday morning, with vague recipe in head hand, we visited the semi-local homebrew supply store (a HSL region-ticket trip out to Myyrmäki and back) to pick up ingredients, but alas, they were out of rye malt. Heidi mentioned that the first beer she really enjoyed, after leaving the beer wasteland of northern Finland for the US a couple of years back, was a certain Alaskan White Ale . We decided to try making something like that instead. 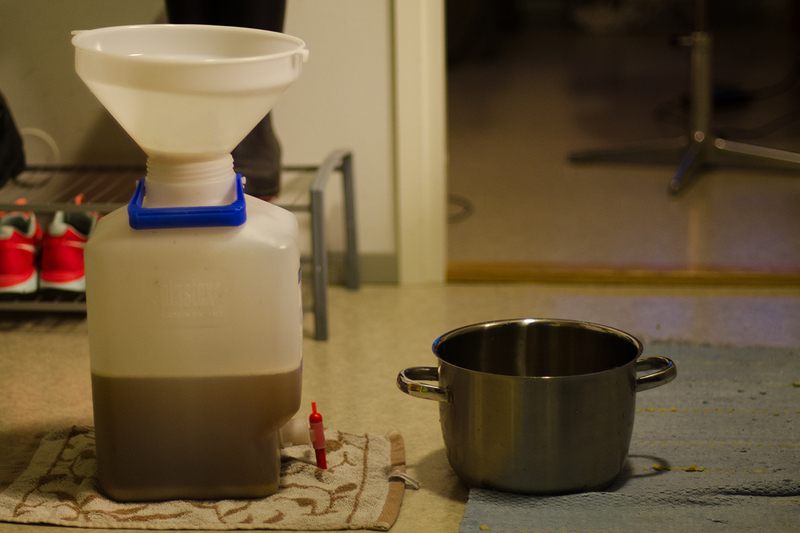 On a rainy Sunday in Helsinki, what better to brighten things up than to make it a brewday? I threw my various equipments in a bag, trekked over to Heidi’s place, and we got started. 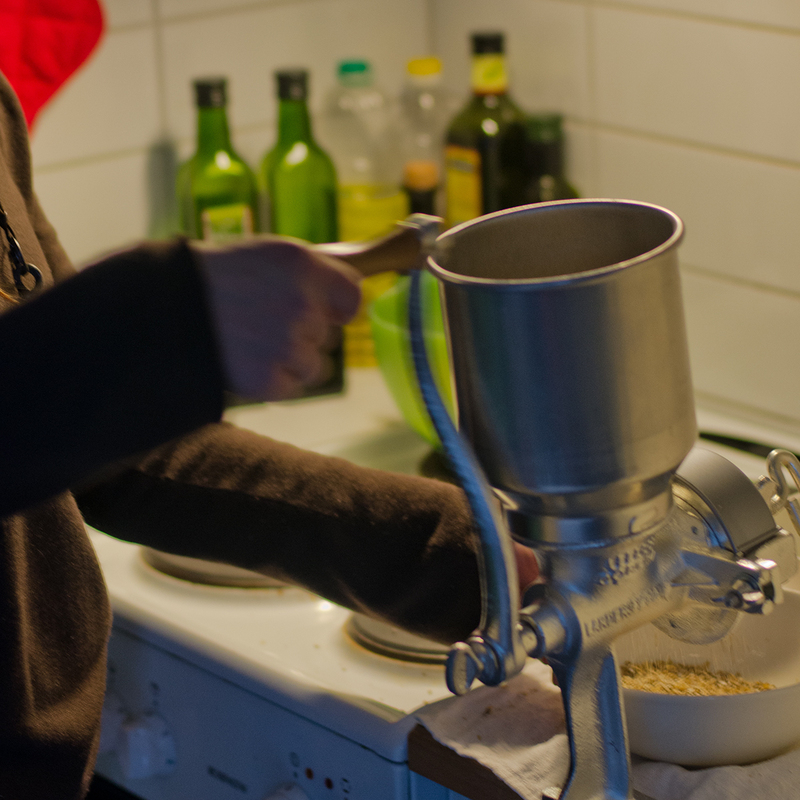 Challenge 3: Assemble the grain mill that the homebrew store proprietor kindly loaned us, and mill the grain that he kindly sold us. Barley and wheat, good to eat. Or drink. I should mention at this point that I’m using the brew-in-a-bag method. 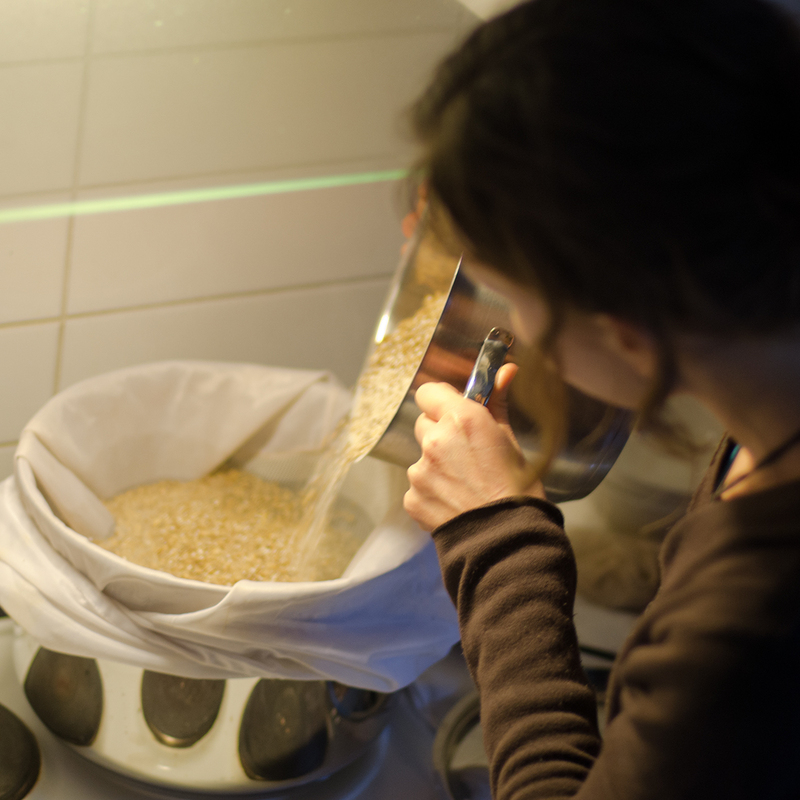 This lets you make small all-grain (i.e. 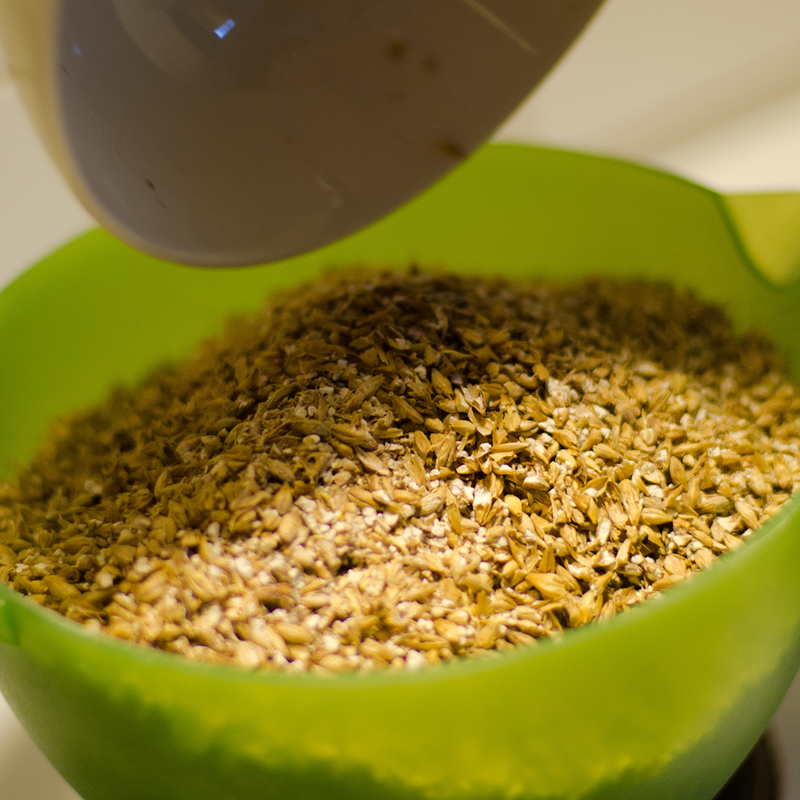 from grains only, not using malt extract) batches of beer, while saving on equipment costs. 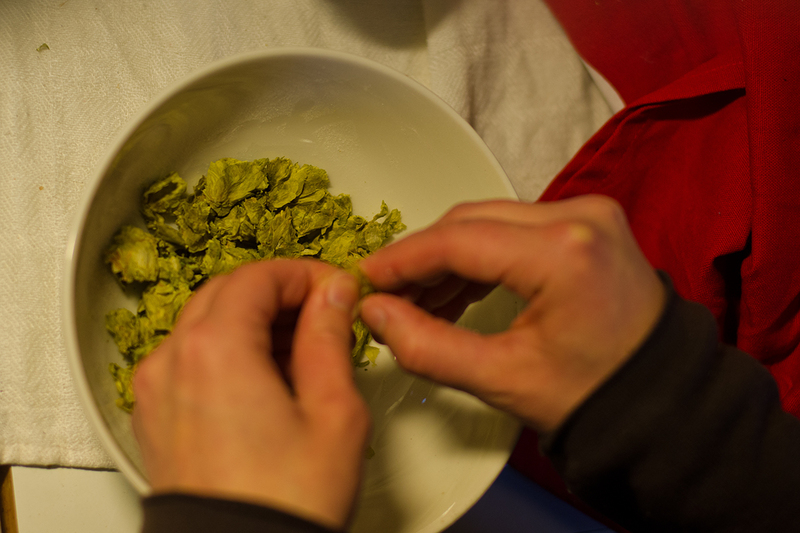 Challenge 4: Explain each step clearly without using brewers’ jargon. Adding the grains brings the water temperature down a little; the aim is to get to 67°C and stay there for an hour, stirring occasionally. The point of this step is to convert the starches in the grain into sugars. These sugars will later be food for the yeast to eat. Here’s the nice part of this brewing method. Normally at this stage of the process, the wort liquid would need to be transferred from the mash tun one vessel to the brew kettle another, a step that can be difficult and time-consuming. 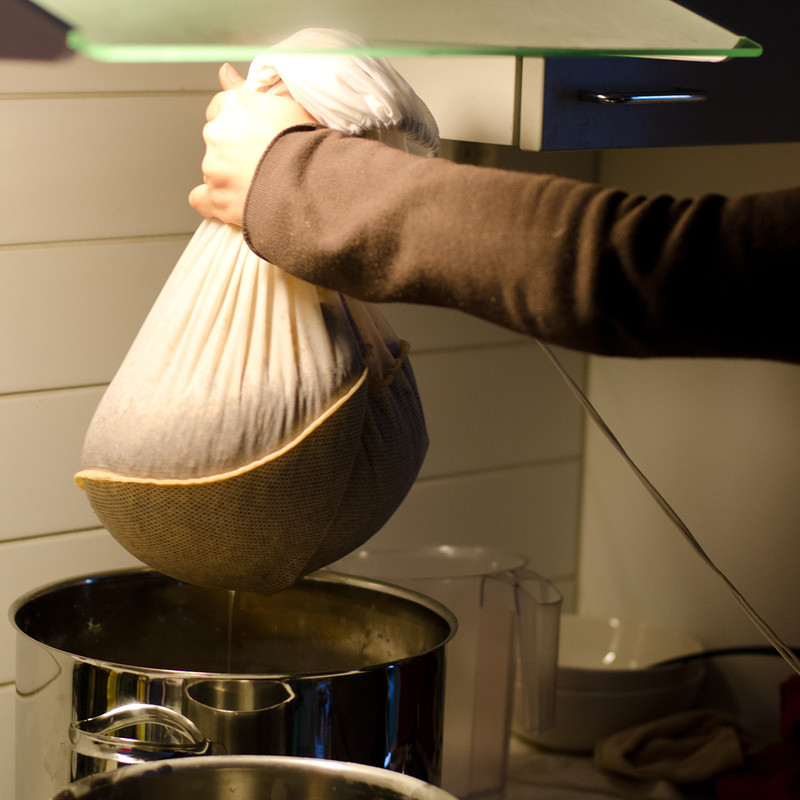 With brew-in-a-bag, though, all you need to do is lift the bag out of the pot, and have the patience and arm-strength to hold it for a few minutes while whatever liquid remains among the grain drips back into the pot. You can also sparge take the extra step of steeping the grain bag in a second pot of hot water to extract a little more sugar, then adding this water to the first pot. Now, with the grain bag removed (we’ll come back to the grain later), we were left with a pot full of wort sugary water. Time to boil. 1. Make tea. You can also add orange peel. 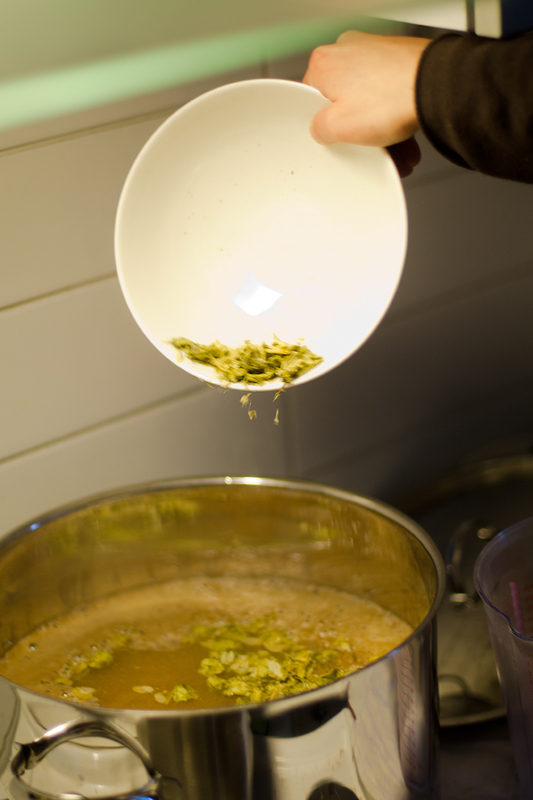 Once the liquid finally began boiling, we added our hops (10 grams of Hallertau Mittelfrüh, a traditional German variety) and let everything boil for an hour. This concentrates the liquid (a couple of litres will boil off) and makes everything a bit more sanitary. Adding hops right at the start of the boil adds bitterness, which balances the sweetness from the grains. At the end of the one-hour boil, we added about eight grams of crushed coriander seeds, along with the grated peel of one orange. 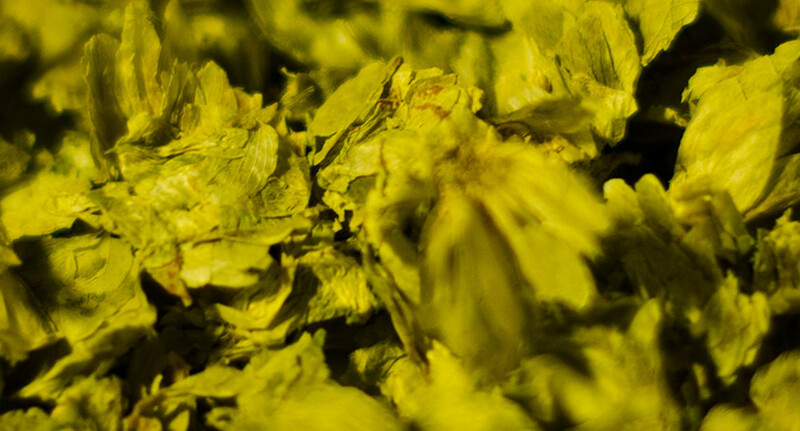 These should add the distinctive Belgian Wit aroma and taste – and already our concoction began to smell like it should. After boiling, the liquid needed to be cooled to about 20°C, a low enough temperature for the yeast to live happily in (it’s important to keep the yeast happy!). We took the pot from the stove and placed it in a sink full of cold water to cool. 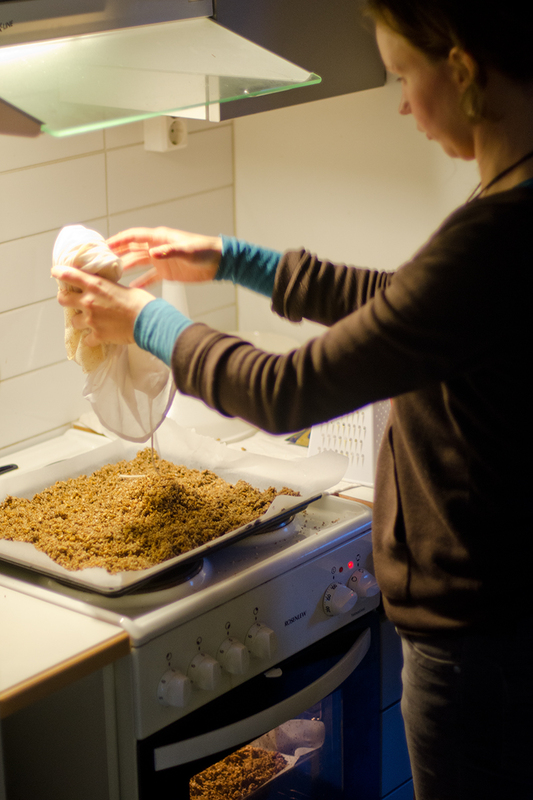 While waiting for our brew to cool, we removed the used grain from the bag, spread it out on a couple of baking trays, and put it in the oven at a low heat to dry out. Since we don’t have any cows or pigs to feed, we can use it to make bread instead. Once our liquid cooled, we poured it, through a strainer to keep out the hops, orange and other material, into a fermenter (i.e. large plastic bottle), and finally added a packet of Belgian Wheat yeast (that we had woken up on Friday after buying it, so it was ready for action). With what seems like a successful brewday completed (beer nerd info: a gravity reading from the fermenter gave 1.050, just about bang on my target), we packed up and cleaned up, and now it’s time for the yeast to do what it does best. In a week or two, when it’s finished fermenting, we’ll put the beer into bottles. Then, after another week or so, it should be ready to drink.